Welcome to Reception's Class Page !! We are now in the second half of the Autumn term and the children are continuing to impress the different adults working in Reception. We have been focusing on learning new sounds and trying really hard to blend them together in order to read words and to spell words. We have been playing lots of games and using a variety of resources to try and develop our skills in blending. We have had a wonderful week in Reception. The children have settled in really well and have participated in many activities. Myself and Mrs Hulme are really impressed at how well the children are able to count. On Monday we had 5 little speckled frogs that helped us to count. 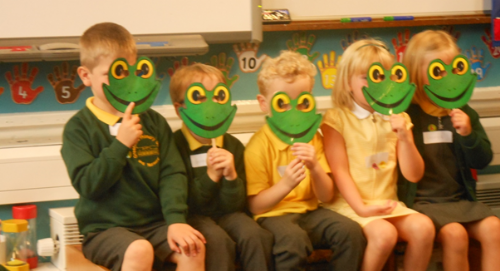 We also had 5 cheeky monkeys that encouraged us to sing as a class and demonstrate our skills in counting. We have had lots of fun in class this week completing various activities linked to our chosen story, The Enormous Crocodile. The children have demonstrated what fantastic imaginations they have! They have produced some amazing pieces of art work as well as telling lots of wonderful stories. One little boy claims that ‘The Enormous Crocodile is in Greenfield’ as he ‘saw it on the way to school and it tried to eat my sister.’ On Tuesday we found some crocodile slime and Miss Davis very kindly helped the children to investigate the rhyming words that the crocodile had also left behind. Perhaps your child could match the rhyming words below? The children had a go at developing their balancing skills as they each had a go at crossing the river. The children had to get from one side of the river to the other, without falling into the water. We are really impressed at how beautiful the children have made their Roly-Poly birds. Some of the children worked independently to make their bird and we are so amazed at how fantastic they look.